Hello guys, here is an interesting topic on CPUsage. 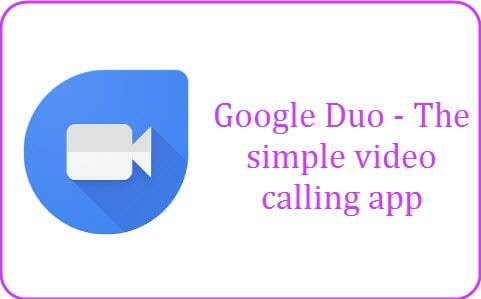 Duo is a recently launched video- calling app from Google, which has been mainly designed for smartphones. The app is available on Android and IOS platform and there is no need for Google account to use it. All you need to do is register with your phone number which sounds similar to Whatsapp and Hike. Google made video-calling very simple for users and got millions of downloads in no time. It lacks some features which are available on Skype and Hangout such as conferences. According to Google, they focused on making an app which can which make users feel like an invitation and not a nuisance. They removed all the resistance which was available previously on video-calling apps. The duo app is all about simplicity and durability. There are no ostentation, bulge and dials available for effective use. It comes with an outstanding feature called “ Knock Knock” which enables you to receive a call with a live feed before you answer the call from the caller which can be made visible or invisible accordingly by the caller. This sounds a bit awkward but you will receive “ knock knock” from people available in your contact list which can be further enabled or disabled when required. This app is fully encrypted for a better security purpose and can automatically adjust the video resolution, which is dependent on your data speeds and network bandwidth. Overall, it received good reviews in the app store. The video-calling market is a bit shady with a lot of competitors such as Snapchact which is most trending right now. Google’s duo can fail to replace Face time app for iPhone users, but it can lead the Android marketplace. Duo app is available worldwide on Play Store and it is receiving a flooding response.